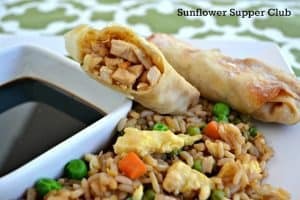 Here is my take on take on Chicken Egg Rolls, minus the fat and calories of frying. These are baked, and they come together easily so you’ll have dinner to the table in a flash. I served them with my fried rice, minus the chicken. You can find the recipe here. In a large bowl, mix together the coleslaw mix, cooked chicken, green onions, shredded carrot, plum sauce, hoisin, ginger and sesame oil. Place an egg roll wrapper on counter with a point facing toward you. Place ⅓ cup (heaping) of the mixture toward the lower ⅓ of the egg roll wrapper and fold the point up away from you. Roll tightly away from you and fold the sides in. Dip your finger in a little bowl of water and run it along the other point and finish rolling the eggroll pressing to seal the point. Place the eggrolls on a cookie sheet coated with cooking spray. Brush the eggrolls with the olive oil. Bake in a 400 degree oven for about 20 minutes, turning them halfway through, until golden brown.